Word includes a laborsaving feature known as Building Blocks. They are, in many ways, analogous to the AutoText feature available in versions of Word prior to Word 2007. Their capabilities are greatly expanded, however. The purpose of building blocks is to allow you to create reusable chunks of content. This capability can be a real boon in some types of writing, particularly if you work in a business (such as the legal field) where your content can be used over and over again. There are two other terms you need to understand in order to get a handle on Building Blocks. The first is Quick Parts and the second is a gallery. Building Blocks can be assigned to different galleries. Basically, a gallery is a way to categorize the Building Blocks you create. There are 35 Building Block galleries defined in Word, and you can use macros to create your own custom galleries. 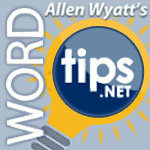 WordTips Microsoft Word, word.tips.net. permalink.